Far be it from me to complain about the participation of trolls in the comment sections of this blog. Trolls serve a very valuable function here. They drive conversation, illustrate various deficiencies in the thinking of NCB and homebirth advocates, and provide endless entertainment. 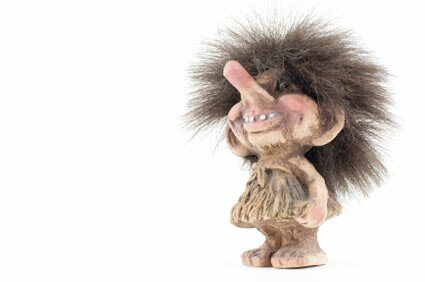 Every science based website with a comment section has trolls, and they share several important characteristics. 1. Trolls invariably have essentially no education on the topic under discussion. Whether it is anti-vax trolls who have no knowledge of immunology, creationism trolls who have no understanding of evolution, or NCB and homebirth advocacy trolls who lack basic education in science, statistics and obstetrics, trolls literally have no idea what they are talking about. 3. Trolls have a serious problem with scientific evidence; they don’t understand what it is. Contrary to what trolls believe, websites written for lay people are not a source of scientific evidence, long lists of citations copied for those websites are not scientific evidence, and the mere existence of a paper that expresses a particular point of view is not scientific evidence. 4. Trolls seem to be entirely unaware that you have to READ a scientific paper (the whole paper, not just the abstract) before you can declare that it is scientific evidence that supports your point of view. They are also unaware that publication in a peer review journal does not mean that a paper’s conclusions are scientific evidence, merely that the author’s views are worth being included in an ongoing discussion of an issue. 5. Trolls have terrible problems will logical fallacies. They love and frequently employ the fallacy of the lonely fact, the argument from ignorance, and the ad hoc fallacy. 6. Trolls have serious problems with basic logic. 7. Trolls suffer from hubristic self-assessment. Sure it takes a real doctor 4 years of college, four years of medical school and 3-5 years of residency to become knowledgeable about his or her field, but the troll assumes that is for mere mortals. For a troll, reading a bunch of websites written for laypeople is all that is necessary to achieve a level of expertise high enough to advise and criticize professionals. 8. Trolls love conspiracy theories. 10. Trolls are easily frustrated when others fail to recognize their blinding (to themselves) brilliance. In very short order, they start personally insulting those who frustrate them by demanding scientific evidence that they cannot provide. Finally, when you’ve used up all the above tactics, say you’re not going to waste any more time with the [critics] you’ve been debating because they’re too sad, stupid, closed-minded, ______ (insert other flaw the [critic] has) to understand your brilliant arguments. Make a big grandiose statement and exit to start anew somewhere else.